It was the age of Atlantis, when nine kings ruled in peace and prosperity and the lives of their people were saturated with extravagance. It was also an age marked for destruction–a fate to dwarf the devastation caused by the outbreak of war after two millenia of peace. In Taliesin, Stephen R. Lawhead slashes through the veil of mystery surrounding Atlantis. The story follows two main characters: Princess Charis, daughter of one of the Atlantean kings, and Taliesin, druid prince destined for greatness. Princess Charis learns of her land’s impending doom and manages to escape, but not before Lawhead breathes life into the legendary city of Atlantis. Across the ocean, Taliesin maintains a vastly different but just as intriguing existence; his life linked to Princess Charis’ before the two ever meet. A tale of hope, heartbreak, violence, and love, Taliesin is a brilliant intermingling of fiction and history. Though written in 1987, the craft used to write this story makes it timeless. Lawhead writes with intricate detail to construct setting. Though I’m not a fan of overdone scenes, the detail used here was appropriate. The palaces, arenas, gardens, and caers were of foreign places and fictional times, therefore it was Lawhead’s responsibility to set the stage, which he did well. Characterization was also a strength of this story. Each character was introduced with distinct, memorable qualities, so that they became real people who inspired real feelings. Charis grew from a spoiled brat to a wise, determined and heroic woman. Her mother, Briseis, exuded wisdom characteristic of noble queens, and concern inherent in caring mothers. Annubi’s sarcasm and familiar style of communication made him easy to relate to and just as easily trustworthy. Better still was the plot. Tension continued to grow and unfold as the story progressed. Though the fate of Atlantis was inevitable, Lawhead wrote in such a way that I continued to hope and root in certain scenes for a different outcome than what was expected. Backstory was well-timed and so well written that it kept the story flowing despite pumping in details of the past. Even stories within the story were interesting, and everything–however subtle–had its purpose in the final product. In short, Taliesin was a phenomenal novel written with excellence. I haven’t been this excited by a work of fiction in a long time, a fact which earned it five out of five stars. Though I’m sad it’s over, I’m beside myself happy that it’s the first in a series, and I can’t wait to get my hands on book two. Lawhead is as amazing writer. Taliesin became the launch of the Pendragon Cycle of books. 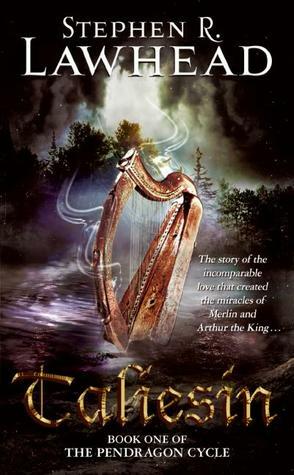 I’ve also read his Dragon King trilogy, Celtic Crusades, and the Song Albion series. I recommend them all! I agree I’m hooked by his writing! It was excellent in my opinion! Truly a current classic (current being post 1980). My library doesn’t have it! I’m trying to track it down! I couldn’t find it at the library either. I had to order it on Christianbooks.com. I think it’s also available on Amazon, but of course you can borrow mine :-). I think you were generous in your review. The setting, detail, and characterization was good, but nothing happens! It’s an entire novel setting up the second book. I was thoroughly nonplussed the way this one ended and don’t care enough for Charis to see what happens. Nothing happened!?!?!!!!! My heart only broke into a thousand little pieces! But you are young and jaded, my friend. This world has toughened that little organ beating blood through your veins. For that, I must forgive your less than generous assessment :-).